I have taken up a position on the sailing committee at Mounts bay solely to try and establish some ol' fashion course racing and to build club membership. 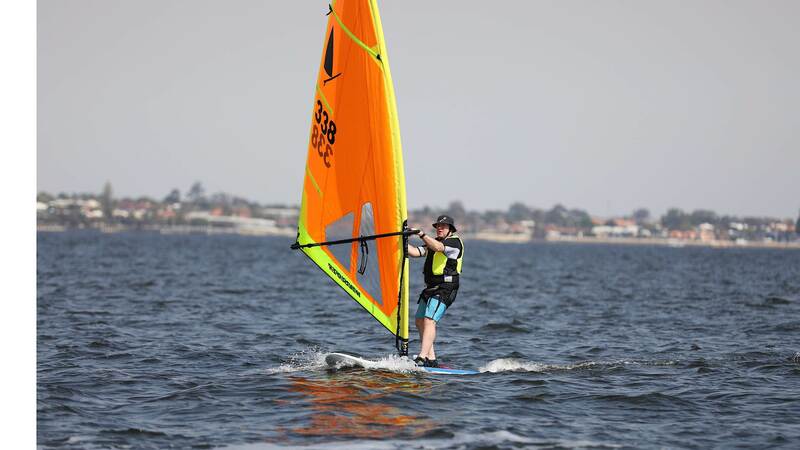 The primary focus is to use the new Windsurfer LT as well as any of the old style boards that may be lying around. My aim is to have organised racing each Sunday through the upcoming season which begins on October 6. At this stage I think we may get anywhere up to 10 boards but I cant be certain, it doesn't help that most of us don't actually have our equipment yet albeit I am led to believe deliveries will take place around the week before the season opening. In any Case as the club allows anyone to attend for the opening day I though I would extend the invitation through to other boards. I have secured a start for the Windfoilers of which there may be 4/5. 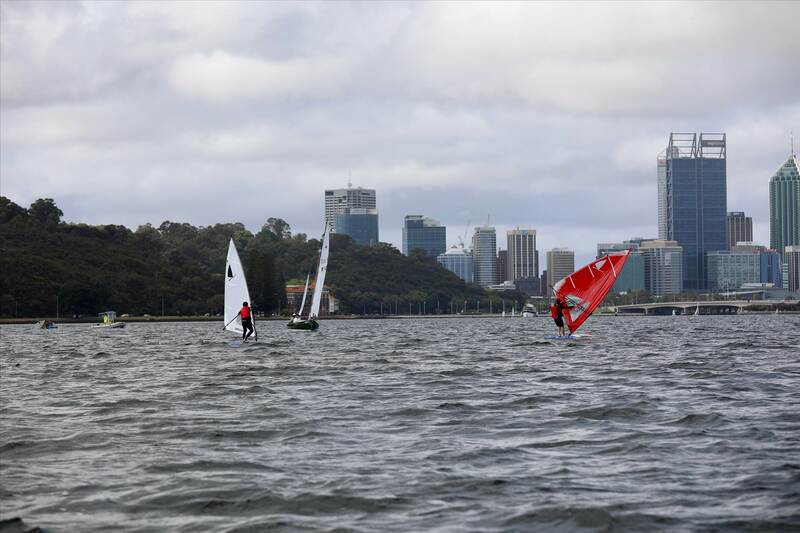 The foilers will start with the foiling moths as they are closer matched to a moth rather than the ol style boards. In addition I would extend the invitation to anyone who has a race board or formula board as well. If enough numbers show up we can create different fleets as well. Note - to sail and race at Mounts you will need to adhere to racing rules and regs- as well as life jackets etc. 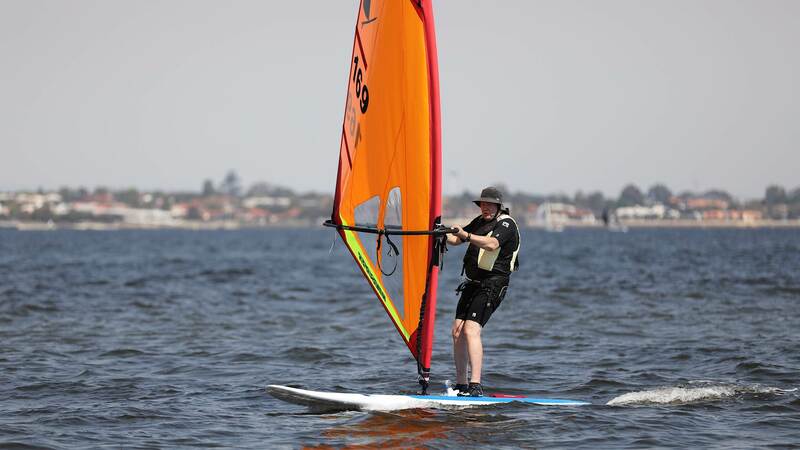 you will also need to be a current fianancial member of Windsurfing WA. 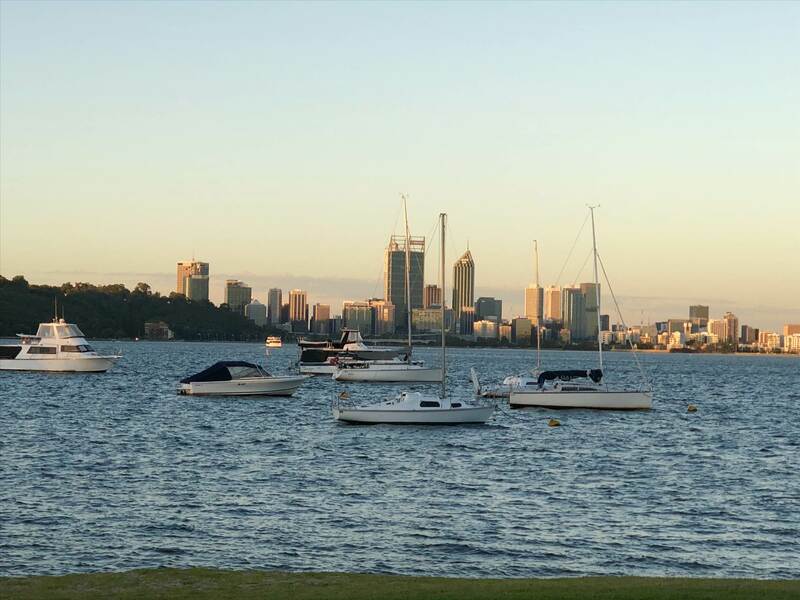 Mounts bay is situated on the city side of Pelican point. storage fees in the lock up boat sheds. This will be very handy for storing the big boards! Also I believe the fee for registered racing will be dropped (need to confirm this). This means membership is super affordable to the point I believe its possibly the cheapest club on the river. Membership rates Should be live on the club web site. If you haven't been to mounts bay I would recommend a visit as the view is unmatched by any other club as well. Thanks Snides. My new LT should be at the club before then and I will participate on that. 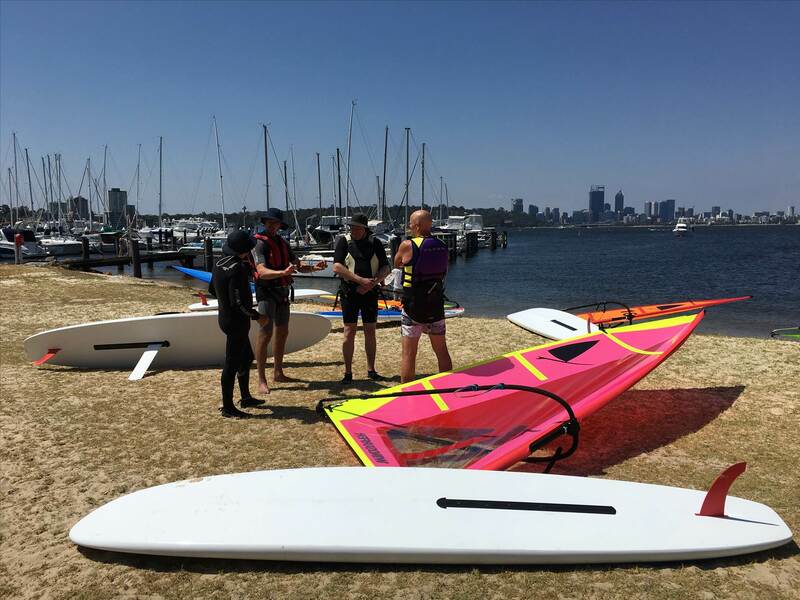 Greg Johns told me there are over 20 boards in WA so the chances of a good size fleet are very high - the "80s" are returning. I have joined the club already. 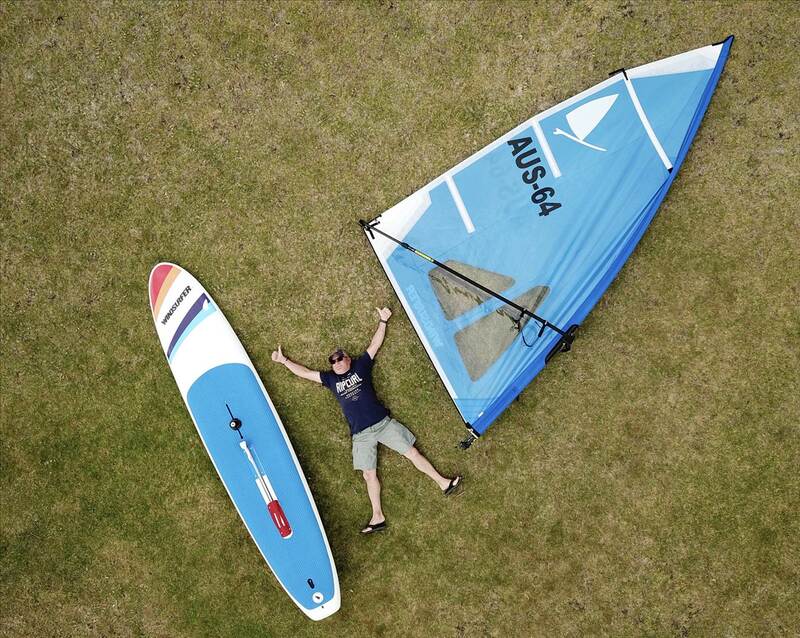 Good to see the foilers will be starting too. Thanks for organising. Nostalgia. 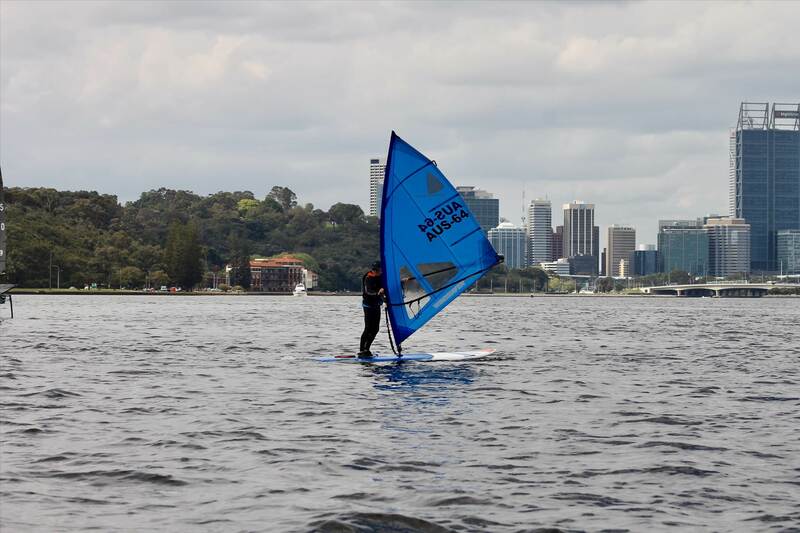 MBSC is where I learned to windsurf. I'm not interested in racing though... sorry. 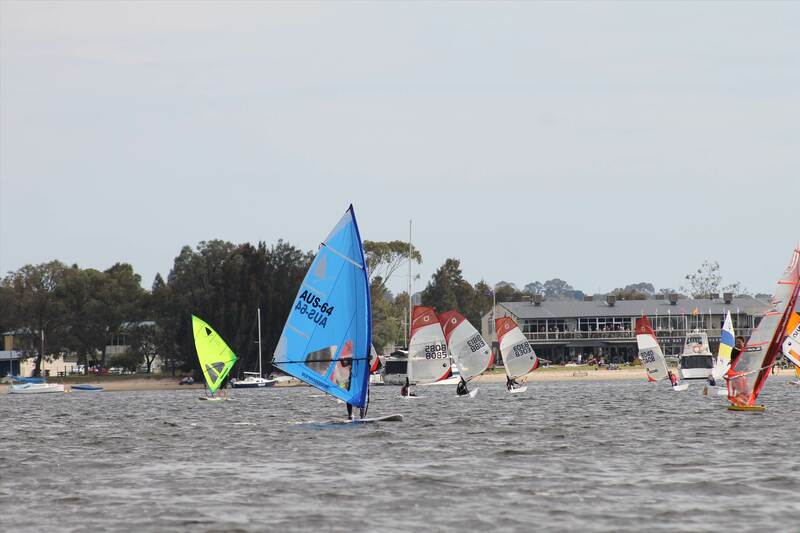 Are bic techno 293 welcome RPYC have at least 4 to 5 bics. who is ready for old school racing? Season opener at Mounts bay this Saturday from around 2.30 start time.Future racing on Sundays starting 14th. All are welcome to come down and check out the latest in one design racing!?? 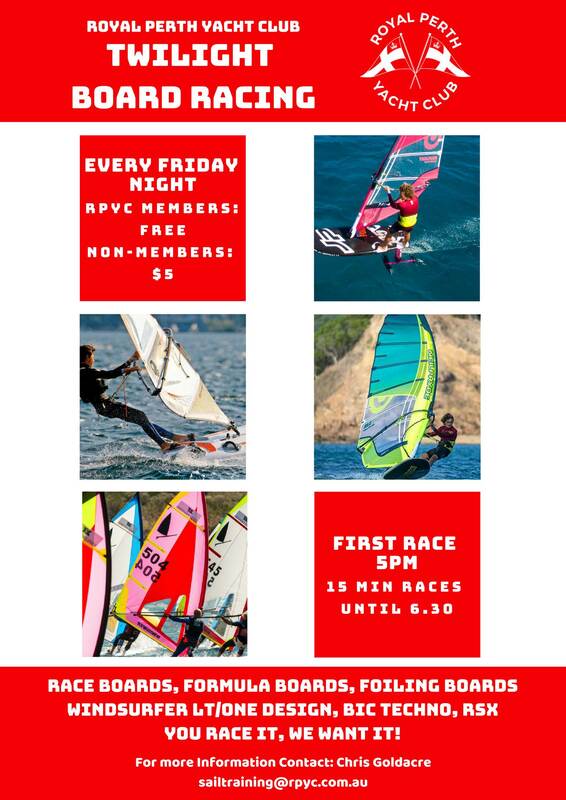 RPYC welcomes Old School Windsurfers, starting on Friday October 19th at 1700 or as soon as you can get there. We will be running a number of short course races in the Bay with a Safety Boat in attendance followed by a BBQ with refreshments. Now is definitely the time to get that old Wally dusted off, but if you have any long boards you are welcome to come and have a blast! 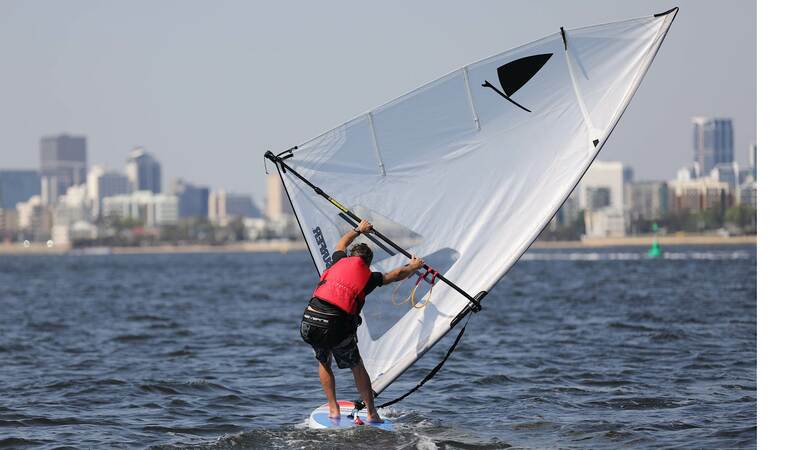 Foiling boards are also welcome! Families are welcome to join in the post-race relaxation and the BBQ picnic on the lawn. 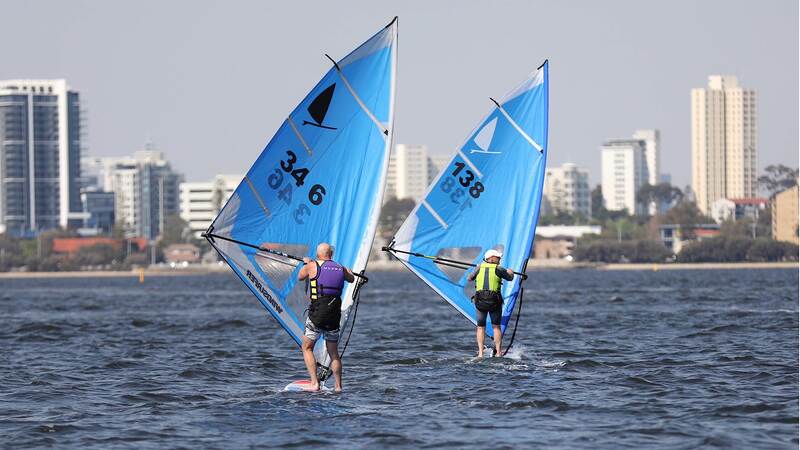 We'll also be running course racing for windsurfers again this season in conjunction with our normal dinghy racing on Sunday afternoons for all those who are interested. 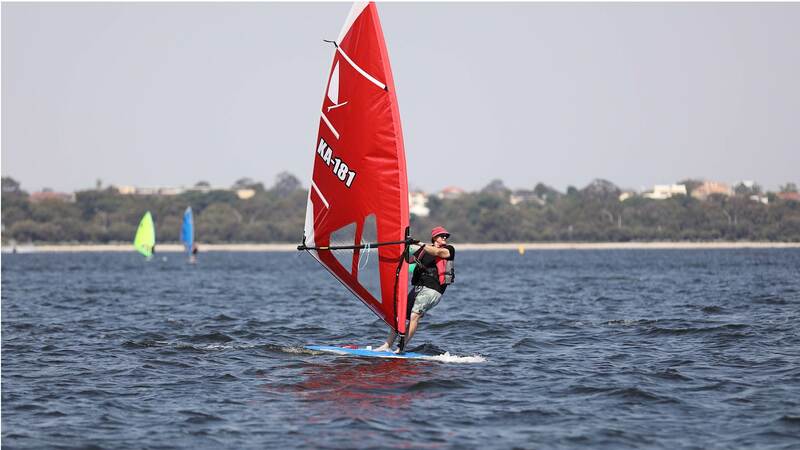 Please contact Chris Goldacre for more information at sailtraining@rpyc.com.au or 9389 1555. 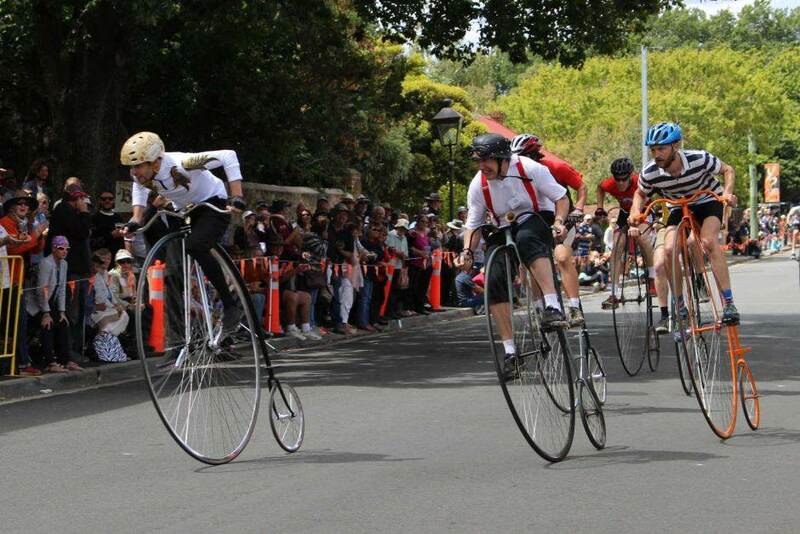 Are there foil races on Friday nights or just one designs? 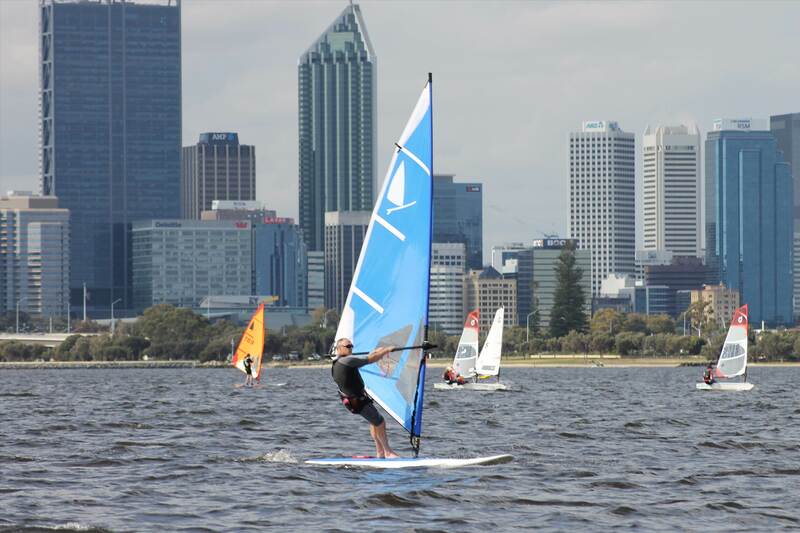 We are more than happy for foiling boards to join us for the twilight racing! Moving on from the thread hijacking above.. 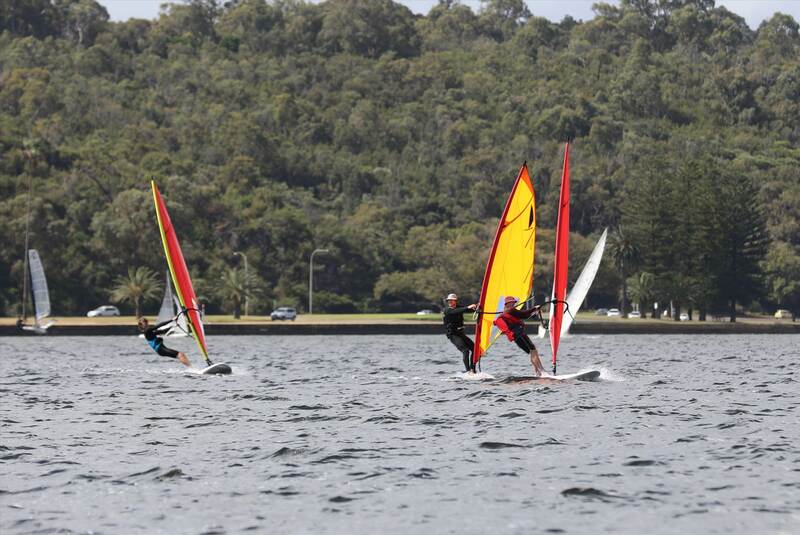 Yesterday Mounts bay saw the rebirth of the legendary Windsurfing Class. This class of board gave its name to the sport we know today. A good turn out was had for the opening day and it saw around 14/15 boards on the water. 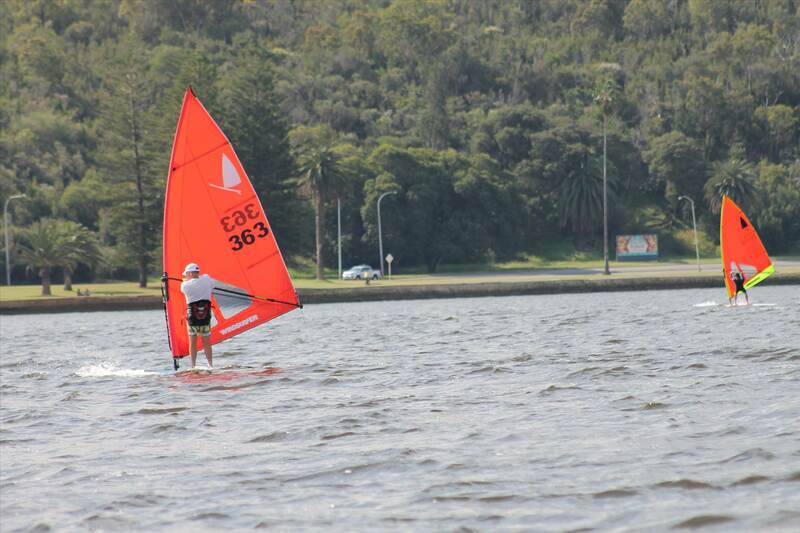 Winds were light to start around 5kn and built to around 12 by the end. 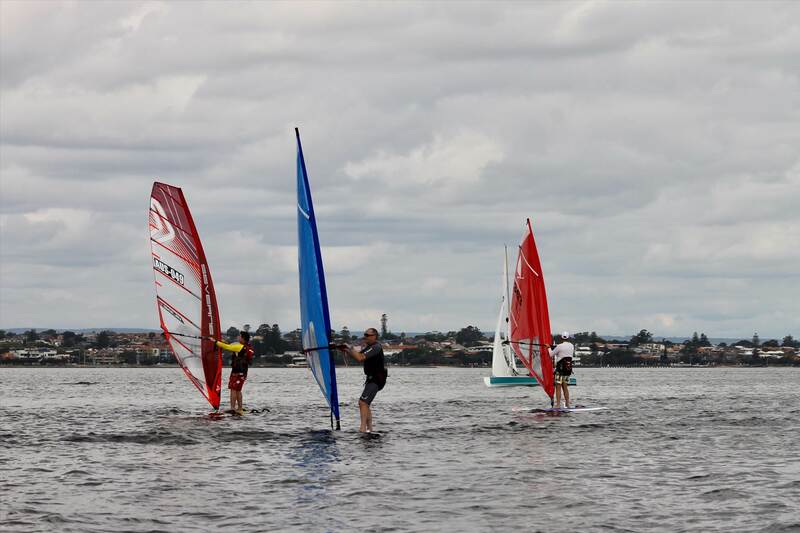 The windsurfers started in a combined fleet with the Bics and the 1 mistral. 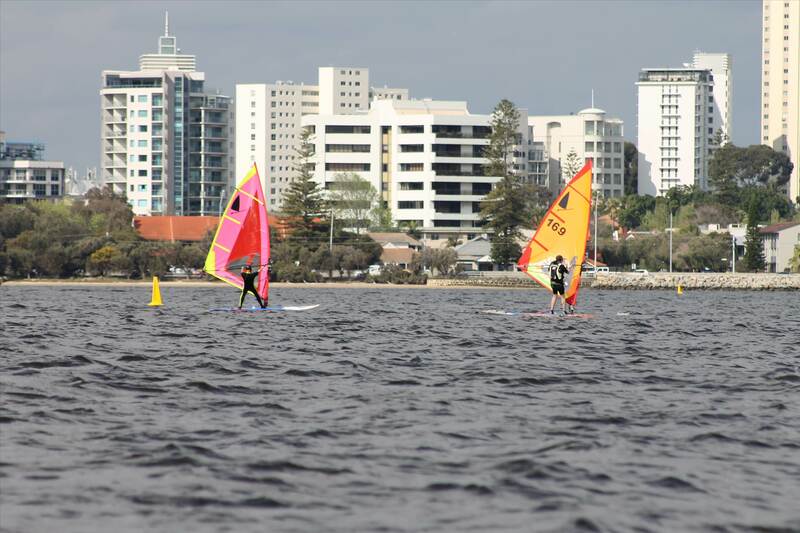 ahead of the first windsurfers. I think there may of been a few sore crew last night, but at least they have a week before they front up next Sunday. Thanks Snides and to Cheryl for the photos. The LT movement is growing: the rebirth of cool. 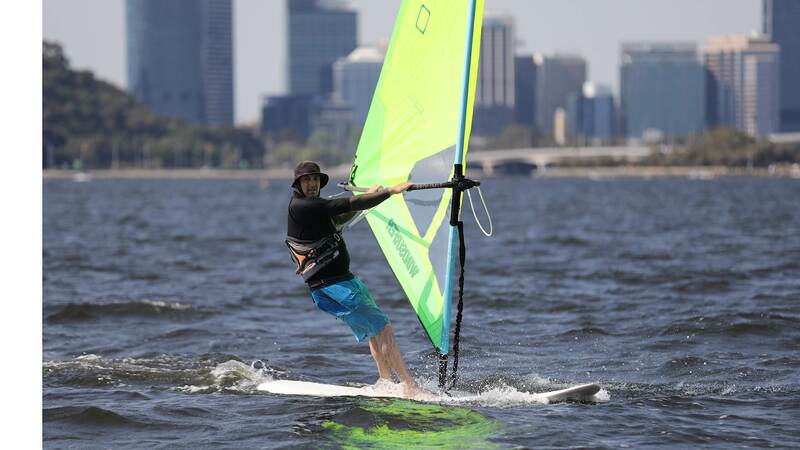 The foils were cool too out there. It was fun. 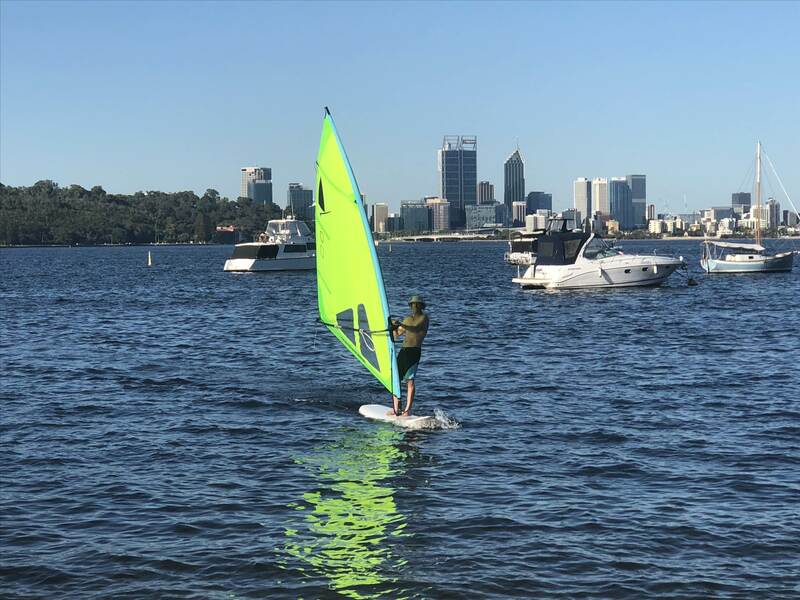 Did you sail yesterday ? Ok tonight there may be some Training on at Mounts. there will prob be a couple of boards out. 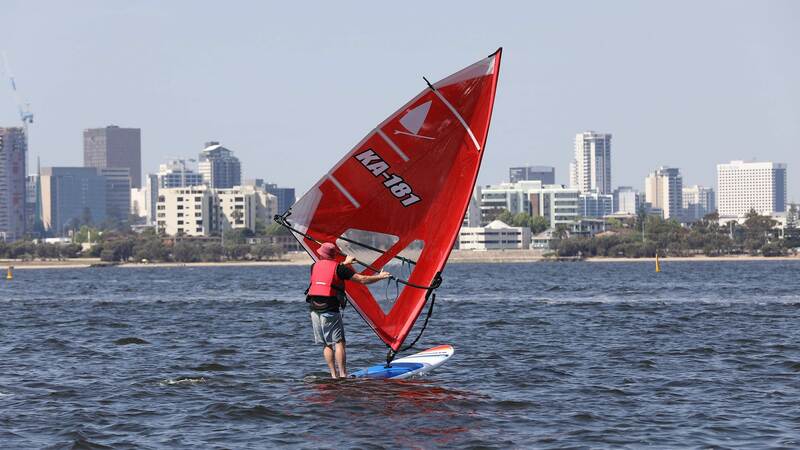 As it's the start of the season for the mounts bay keelboat fleet, the club and bar will be open. gererally there is food available as well. The Calendar for the season is below. not much wind but enough to get around. 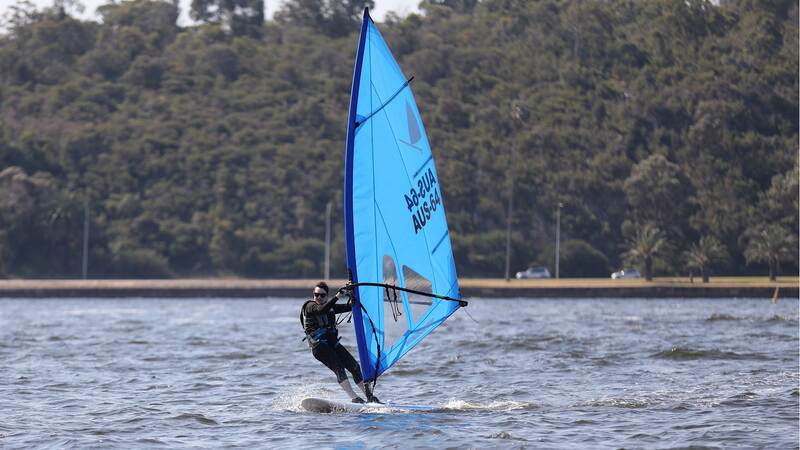 it didn't deter a couple of guys from testing the Lt speed off the wind Denis hitting 22kn a couple of times. 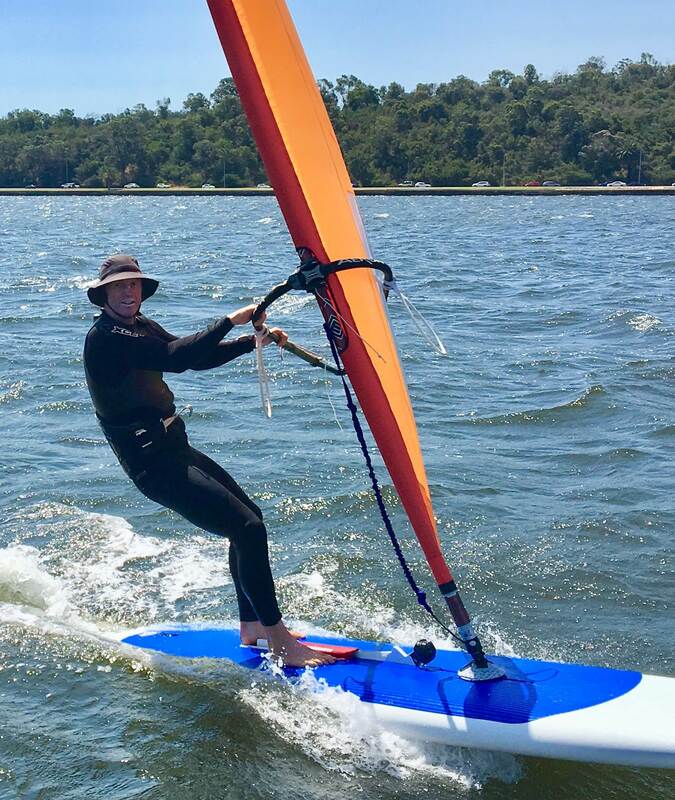 Soft sail,no straps no problems. an extremely short clip with some average footage. 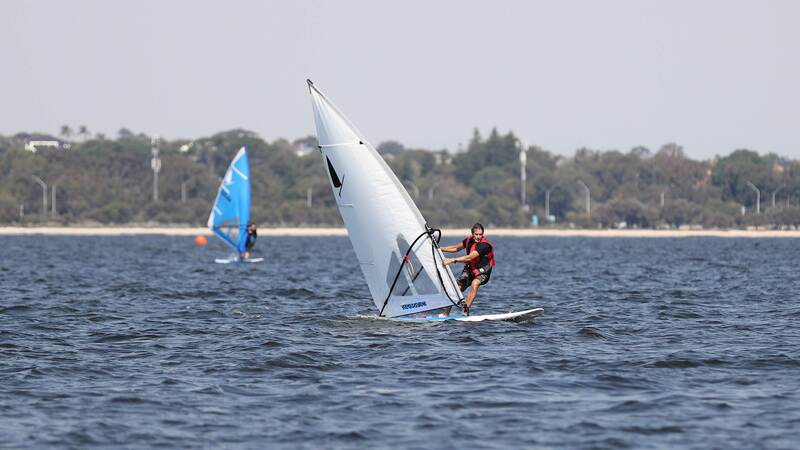 we have been invited to race at Perth Dinghy Sailing club this Saturday,first starts around 14.30.
we will probably be lumped in to a mixed fleet start with other classes. Actual specific courses and start times will be determined on the day. As the club has some issues with room I would suggest rigging at mounts bay and sailing across for the start. and give a briefing there. Obviously you are welcome to rig and sail out of the Dinghy club on the day if you do choose. Also it goes without saying that all are welcome back at the club after racing for beers and bull****. Briefing at the sign on desk around 13.00. Unfortunately As the Wally's are the nominated volunteer for the day I will be driving a rescue boat.Good news is I will be armed with a canon to shoot loads of pics so I suggest wearing make up and sucking in the gut when I take your pic! finally as usual there will be a few Wally's out Friday night as well for training. 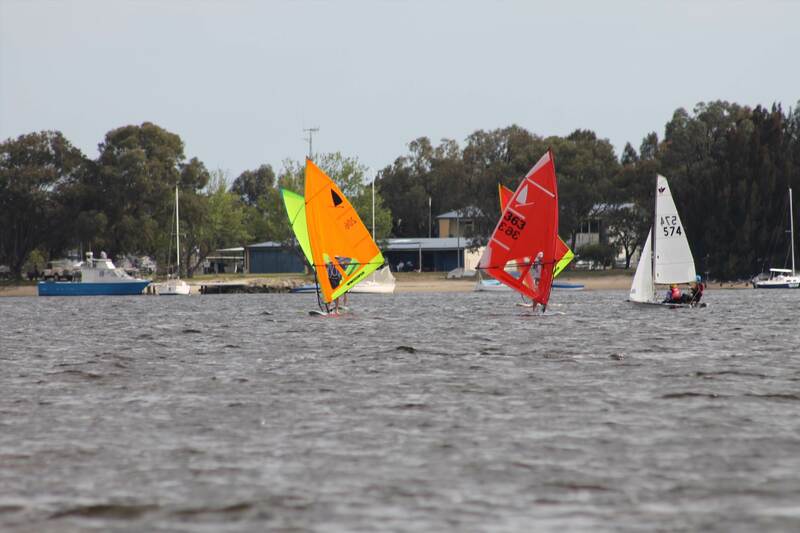 Windsurfer results from the weekend. 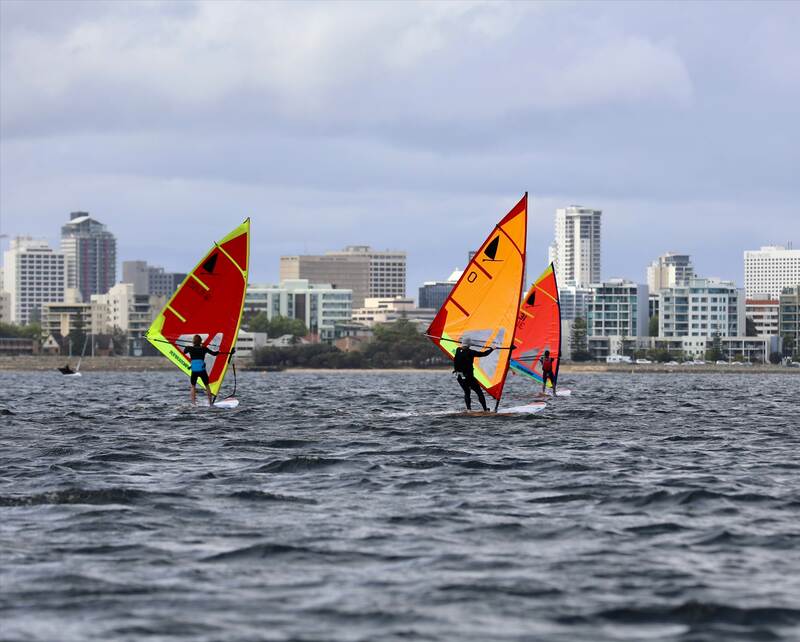 The windsurferLT's had a busy weekend of racing. 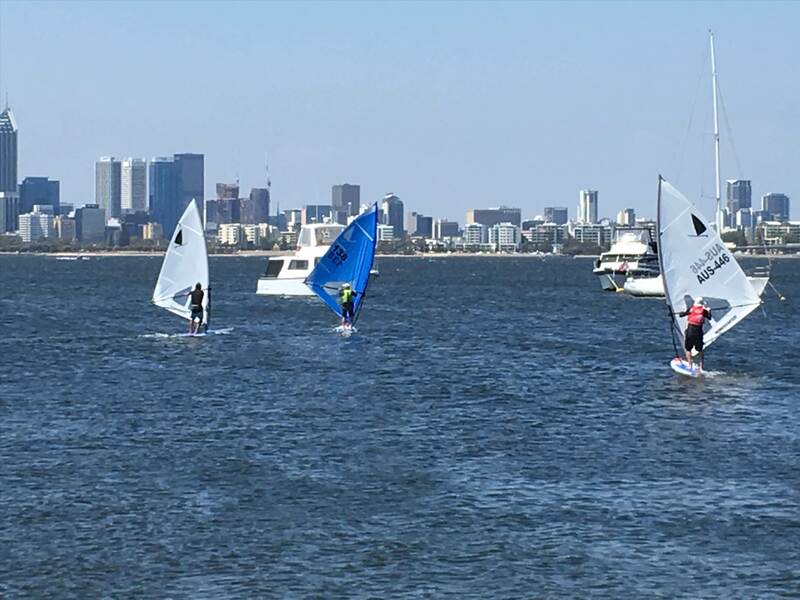 Saturday saw the opening of Perth Dinghy Sailing club which is located in Matilda Bay. Conditions where super tricky with varying wind gusts and swinging wind directions due to the Nwester. 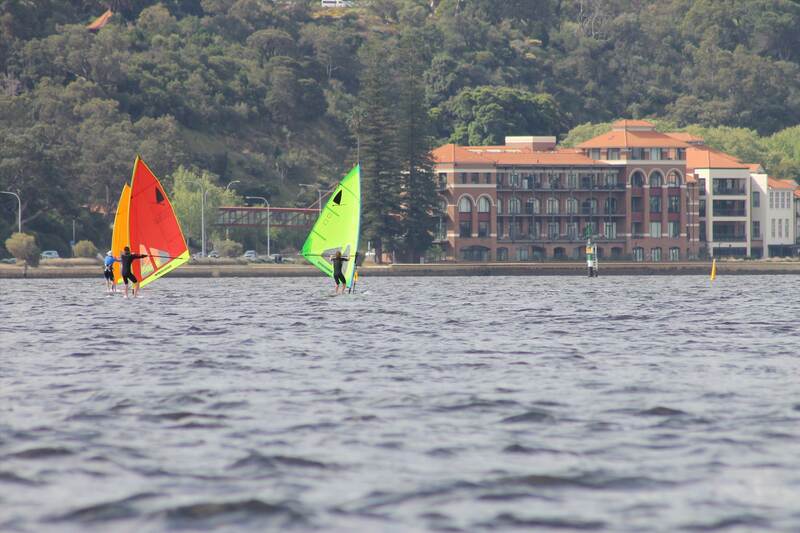 The start saw 10 boards and 1 mistral dual it out on a start line combined with 2 other classes of dinghy. After a marathon 15 odd km's Yours truly snuck over the line just in front of Denis Jones and 80's legend Nick Poll. 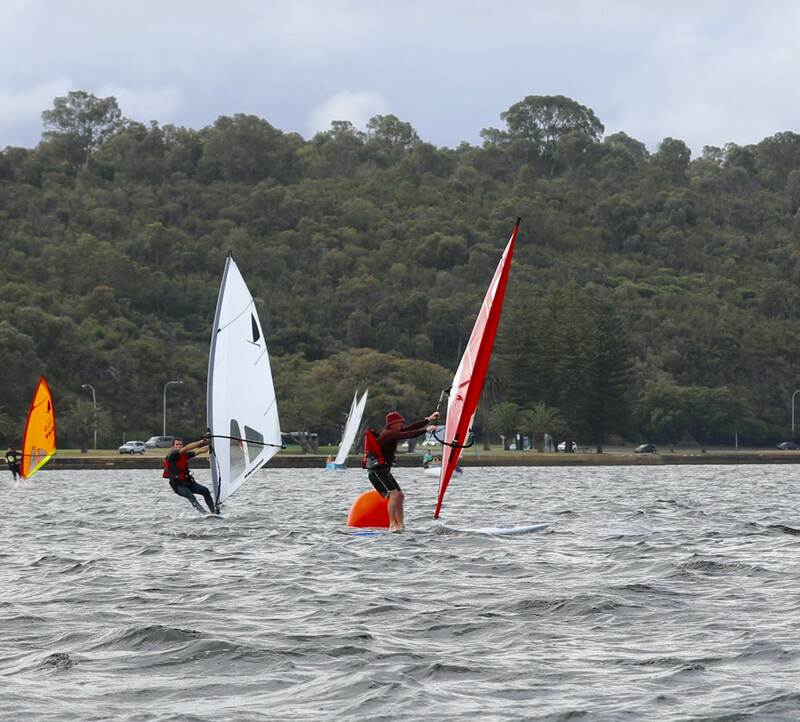 Sunday saw a short race series at Mounts (home turf for LT's) with 3 races and 11 starters held in patchy winds as well. 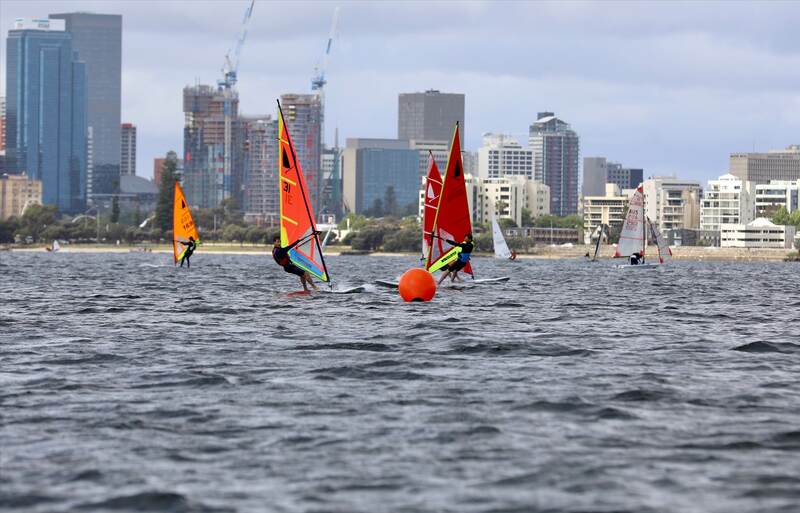 This race series saw the attendance of several ex world,National and state champions from various disciplines of the sport as well as the sailing world...needless to say after all these years everyone was pumping furiously and as competitive as ever. Notable inclusions where Scott McKercher,Mike Galvin and recent dual National champion Tim Gourlay. Mike Galvin took the chocolates Scotty second and Denis Jones 3rd. 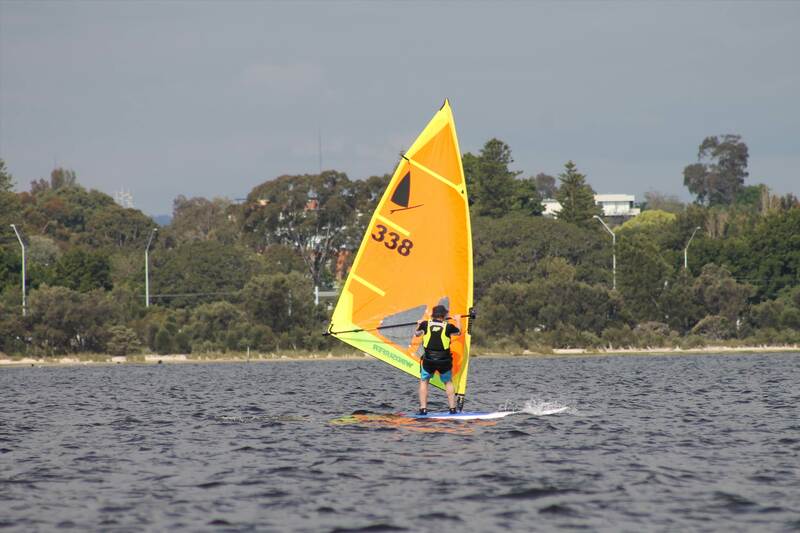 Local shop owner Mark Taylor (Surf sail) also made a welcome return to the class. Pics below courtesy of Cheryl AUS 841. More racing next weekend . If anyone is interested in the new class or want to take a closer look please pm me here. Scotty and Galvo dueling it out! 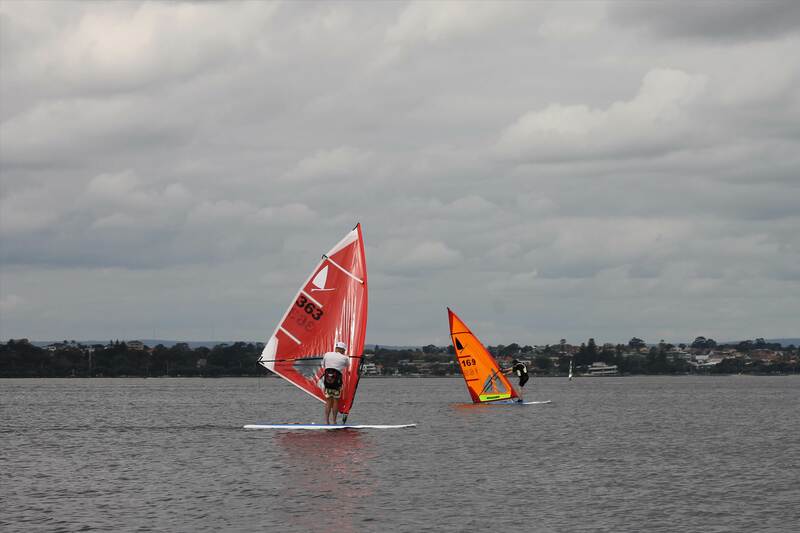 So yesterdays sensational weather saw racing at Mounts bay again and again another light breeze. The crew opted for a change of course with the intro of a triangle,sausage. KA 181 lead from start to finish. The racing was tight with numerous position changes from second down to 10th. the first 5 separated by prob 4-5 mins after about an hour of racing. on a Wally (mine ) and her first tacks in prob 20 years! 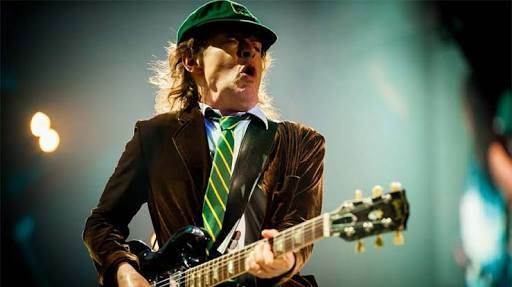 Beers,bull**** and blow flies where the topic of the day once everyone hit the beach. Next Sunday sees another club race before a club championship heat the following weekend. Hi Steve, are the competitors have a handicap applied like as in yaucht races, or is this just standard best fastest wins? Very Early days yet might look at handicaps should the sailors want it. more inclined to start weight divisions again when numbers increase. 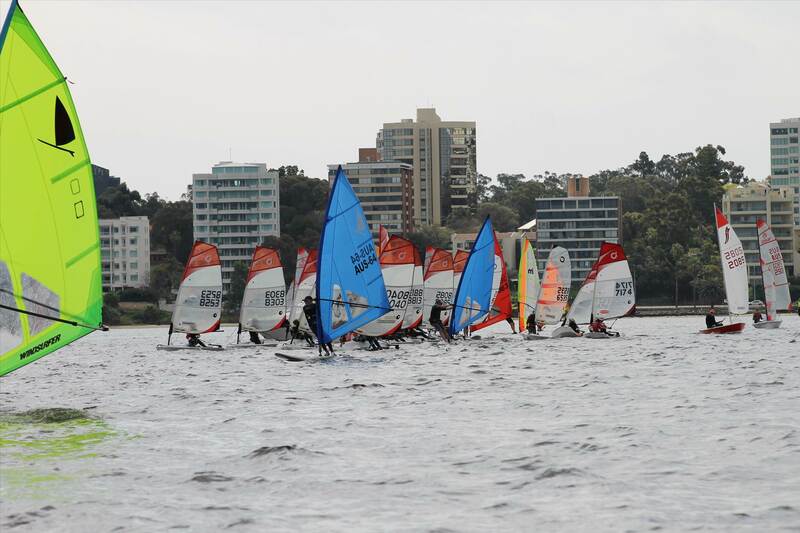 So another day of great racing was had yesterday at Mounts Bay Sailing Club. 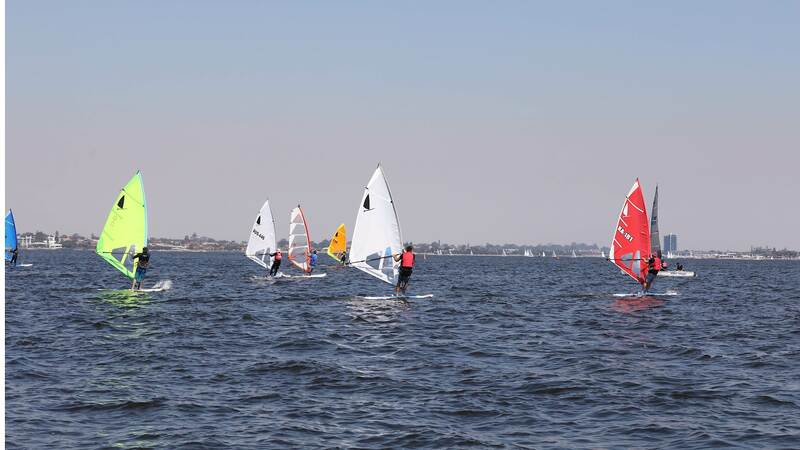 Conditions where Tricky with lots of holes and shifty westerly winds ranging from 8 to 18knots. 1st was Tim Gourlay followed by Ian Lane then myself. Next week sees the first club championship heat (actually number 2) as number 1 will be resailed at a later date. To figure in the championship you will need to be a paid up member other wise all are welcome. 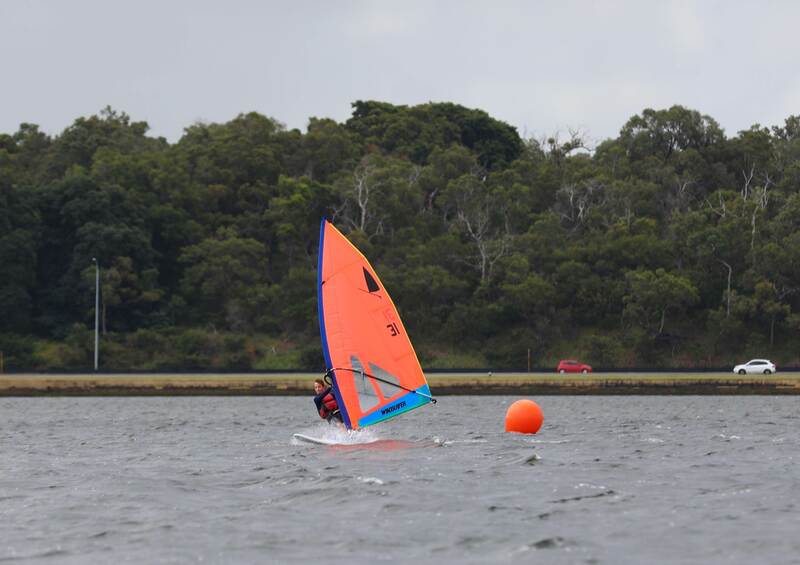 Just a note the lack of sign on/off, PFD's and sail numbers may mean no result for that sailor. Also when retiring from the race please do not sail through the Finish line on the way back to the beach. 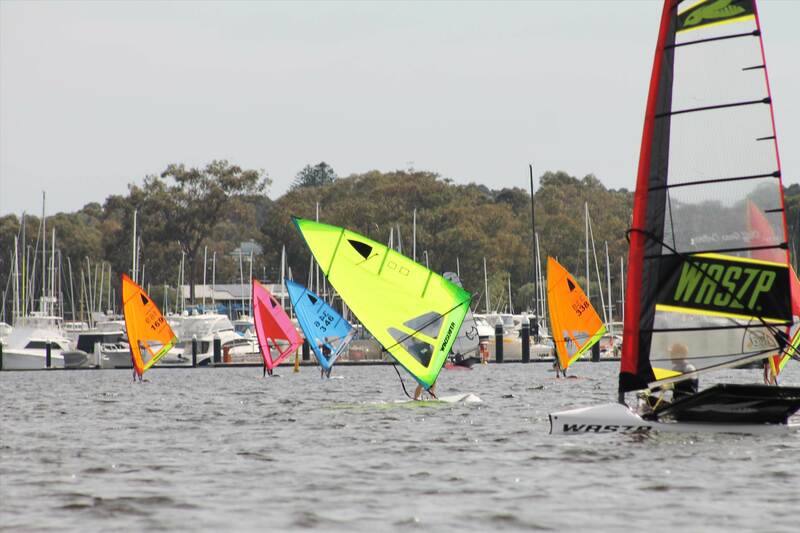 Last Sunday saw the windiest race day to date with gusts well in to the low 20's and a rogue to 28! This had the soft sails working overtime to handle the draft wandering tendency's. once again racing was tight and several position changes through the field. next Sunday is looking a little tamer.